Gainsborough Trinity interim manager Liam King has urged fans to back the Holy Blues in their “exciting” finish to the season. A 2-0 win at Workington on Saturday — their sixth in eight matches — means Trinity go into Good Friday’s home clash with Hednesford in fifth place, the final play-off spot in the Evo-Stik League Premier Division. 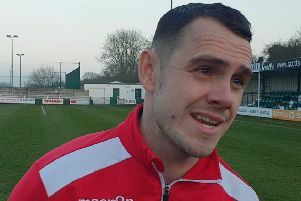 Play-off rivals Buxton, who like Trinity have three matches remaining, could only draw while goals from Ash Worsfold and Ant Wilson earned Gainsborough a vital win to put them two points clear of the Bucks. King said: “It’s exciting with three games to go. We just need to concentrate on ourselves, nobody else. “We need to keep getting the three points. There is something to play for and we need as many people as possible to get behind the lads. “They have earned it, to hear the crowd cheering them on. It has been a long season and they are still there with a chance (of winning promotion). In a bizarre twist at Workington, Trinity had three ‘goals’ ruled out for offside. They should have got off to a lightning start at Workington. In the third minute from a quick breakaway Wilson knocked the ball past the keeper, but then lifted his finish over an empty net. Nine minutes later Ross Hannah did put the ball in the net from a fine Worsfold lay-off, but it was ruled out for offside. Six minutes before half-time Worsfold was booked for diving in the area, but 60 seconds later Trinity were awarded a spot-kick. Wilson was brought down and Worsfold slotted in the penalty. Remarkably Hannah was then denied a goal for a second time by an offside flag as Trinity ended the first period on top, before the linesman again ruled out a Trinity ‘goal’ for offside. The second goal finally arrived in the 67th minute when Wilson headed in an inswinging corner from Alex Byrne. King added: “It was job done and what we set out to do. For the first 20 minutes we were off it and didn’t look ourselves. “Then we had a few chances that were disallowed and Ant Wilson missed an open net... but then he (later) goes and puts in a fantastic header, whch sealed it for us. “We could have had plenty of goals. “It was a battle. We set our plan and it worked. Credit to the lads. After Good Friday’s match, Trinity travel to Grantham Town on Easter Monday before their final league match at home to South Shields the following Saturday.